If you like spicy wings and a great mustard sauce, this will be nothing short of an amazing treat for you. Wings are very easy to cook and very tasty. This recipe features two very good products that goes well together and build layers of flavor. Pig Pen's Hot & Spicy Seasoning is a very good seasoning that brings adds flavor and some nice heat. Bone Suckin Sweet Hot mustard Sauce is simply my favorite mustard sauce with heat. 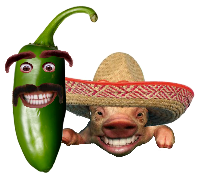 This sauce has small chunks of Jalapeno peppers for flavor and heat. This smoke usually takes approximately 3.5 to 3.7 hours to smoke. Start by rinsing 5 lbs. of chicken party wings. These are the wings that have already been divided. They can be found in the meat department at your local grocer. After rinsing, pat dry with paper towels. 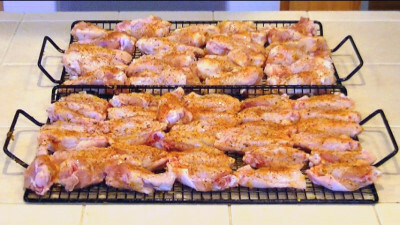 Lay the party wings out on two cookie sheets. Place the drum pieces on one cookie sheet and the wing tip section on the other. This will make it easier to transfer them to smoking trays so they can be moved around in the cooking chamber later in the process. Melt 3/4 of a stick of real butter. Mop the wings with the butter. Once one side is mopped shake on a light dusting of garlic powder. Now lightly shake on some onion powder. Nest shake on the Pig Pen's. How much you put on will determine the heat level. 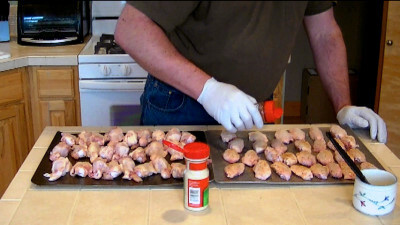 Flip the wing parts and season them just as you did the last side. 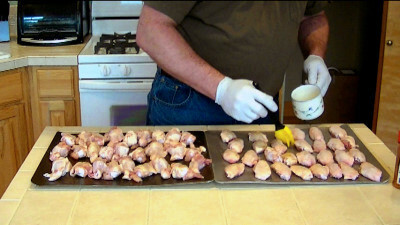 Transfer the wings to smoking trays or grates. Let the party wings sit for about 20 minutes in the fridge. Next place them in a pre-heated smoker @ 225 - 230 degrees. Place the thicker parts at the hotter end of your cooker. Traeger owners, set your Traeger on to smoke for 1 hour then move the dial to 225. 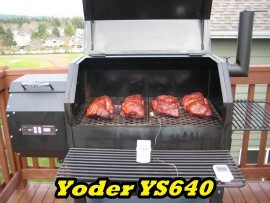 Yoder YS series owners 180 for 1 hour. The lower temp on pellet cookers helps produce more smoke flavor. 1/2 way through the cooking process or about 1.5 hours into the cook flip the wing parts over. Mop the top side with the Bone Suckin Mustard Sauce. Cook one hour then turn the chicken and mop with Bone Suckin Mustard Sauce. 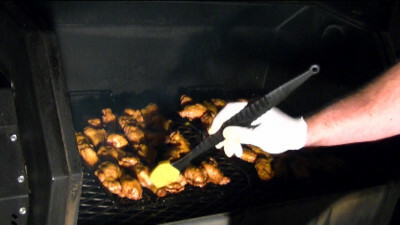 When the party wings reach 160 degrees mop them with Bone Suckin Mustard Sauce one more time. Increase cooker temp to 250 degrees and continue to smoke for 30 minutes or until the internal temperature reaches 175 degrees. 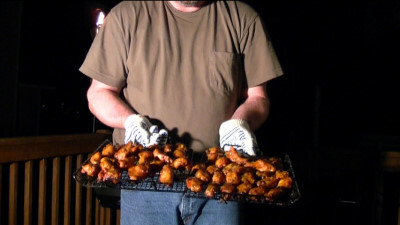 Once at temperature, pull the party wings and serve them up! 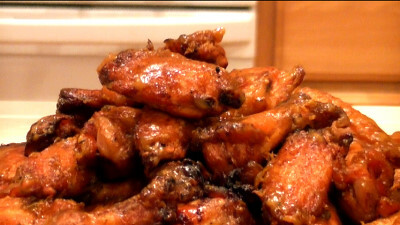 These wings have a sweet & spicy flavor with just the right of mustard flavor and smoke on them. 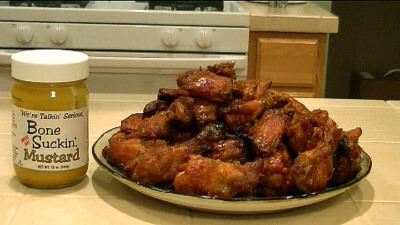 I have to say this is my all time favorite way to cook mustard sauce wings! Hope you enjoy this recipe. This recipe was smoked on A Yoder YS640 Pellet fired smoker.